Once in a while, along comes a project that exceeds all your expectations and strikes a tuning fork of joy in your soul. Sometimes this bliss extends only through the crafting process and the finished product doesn’t quite fit, or doesn’t hold up to wear. Other times, it’s just perfect all around. This is one of those times. 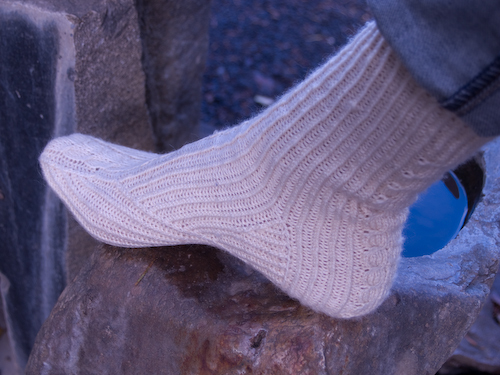 And this is the Arch-Shaped Stocking pattern from Schoolhouse Press, a sextet of patterns (including colorwork versions) created by Meg Swansen after she reverse-engineered the original sock her mother knit with this clever foot shaping. Mine is the Fishbone Cable version with twisted rib. 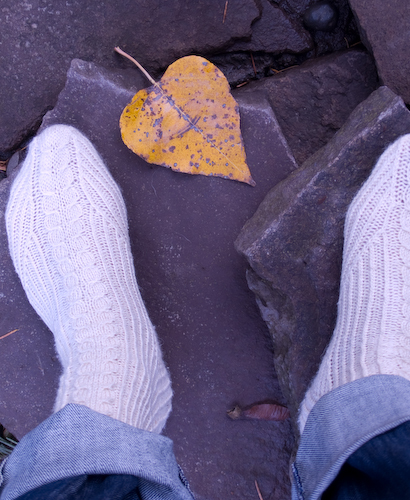 I’ve been wearing these socks for two weeks now and can happily say that they’re the most comfortable pair I’ve knit. I love the architecture of the foot, especially the way the twisted rib along the sole looks like lapstraking on the prow of a boat. Yay socks. 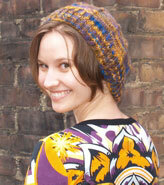 Once in a while a knitter comes upon a happy confluence of yarn and design that’s irresistible. So it was for me with Lenore—that huckleberry yarn, that Gothic lace cuff: I knew we were meant to be. Except that when Marika requested another pair of socks because she loved her Hibiscus for Hope pair so much, I realized nothing in my stash and nothing in several yarns stores reminded me of her the way this yarn and this pattern did, so really I was only meant to be the middle man in the relationship. It took me ten months to cast on, though. (No snorting: I do have one or two scruples about starting new projects when I’ve got so many old ones unfinished.) 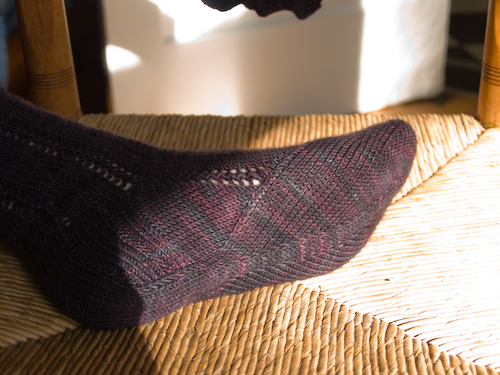 And by that time I’d taken Meg Swansen’s and Amy Detjen’s Arch-Shaped Stockings class at Sock Summit. And I was possessed by the beauty of the arch-shaped foot to the extent that I was ready to slap it on every pair of socks. I like to think Stephanie Pearl-McPhee would be honored rather than offended to have her already-lovely pattern Swansenized… because that’s exactly what I did. You’ll have to forgive the fact that they’re a bit small on me. Marika’s feet are two sizes littler, so I hope these will be just right on her. For some reason, the first of the pair came off as smoothly and beautifully as you could wish, while the second gave me fits. 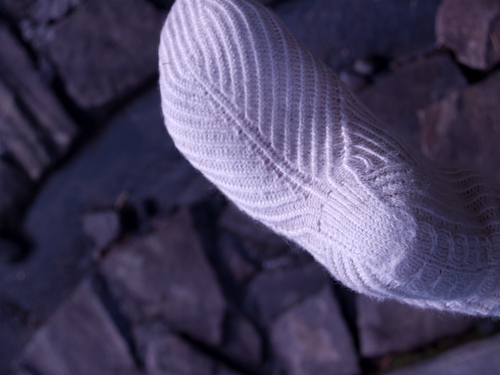 I ripped out the whole foot because I discovered—after I grafted the toe—that my tension had gone inexplicably slack and the sock was nearly an inch longer than the first. There was some ugly pooling going on, too. I actually wondered if I had somehow picked up a larger set of needles (which has happened before, but only on occasions when I slacked off for a year or more between socks and Ravelry hadn’t been invented yet to remind me what needles I’d been using in the first place). I hadn’t. 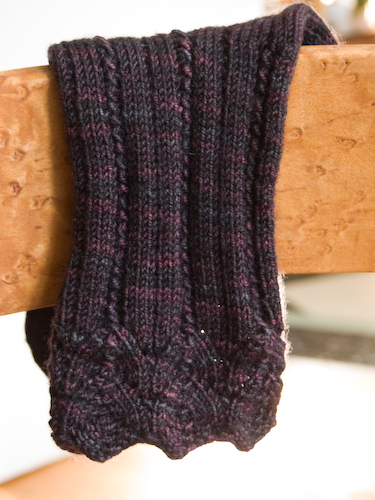 And I wanted to get these socks right, so I missed Marika’s birthday in favor of doing them justice. They’re off and away. I hope they keep my beautiful sister’s toes cozy this winter. *Stephanie’s socks were inspired by Poe’s “The Raven,” but the lost Lenore has an earlier eponymous poem, too. The text is here. I realized I’ve been keeping you all in terrible suspense about the state of my possibly piratish eye. Turns out it was just irritated and what I thought might be a flap of peeling eyeball was only cornesomethingsomething, or a weird eyeball wrinkle with a six-syllable name I forgot as soon as the eye doctor pronounced it. She gave me some eyedrops and sent me on my way. 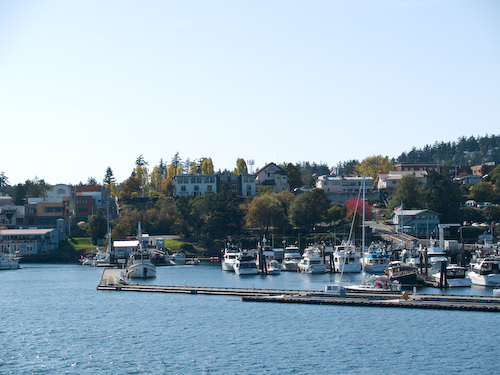 So off we went, patchless and parrotless, to Friday Harbor for a long weekend. I escape up home whenever I can, and this looked like the only opportunity until New Year’s. My parents are building a new house perched on a knoll in a madrona grove. You can see Mt. Baker, the Olympic range, and even Mt. Rainier on a clear day from the site. It was not that clear a day, but the last sun filtering through the trees and warming the valley below was delicious. This stone patio is going to get a lot of use, I’m sure. (Yes, it’s funny that the dog’s belly appears to be the light source in the picture. 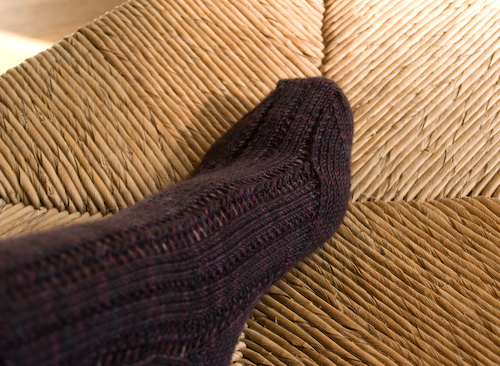 Pssst… spot the handknit socks? I’m not sure you could miss them given the comical length of the pants I’m wearing. I am not so good at packing hastily, and although I dried and retrieved the last round of laundry before we left, I did not take my jeans from the basket and place them in the pile of clothing to take north. So I borrowed pants from my mom, who isn’t as tall as I am. Next time I’ll tell you about our trip over to Lopez and the exciting wool I brought home. Yes, it was a good weekend in more ways than one! 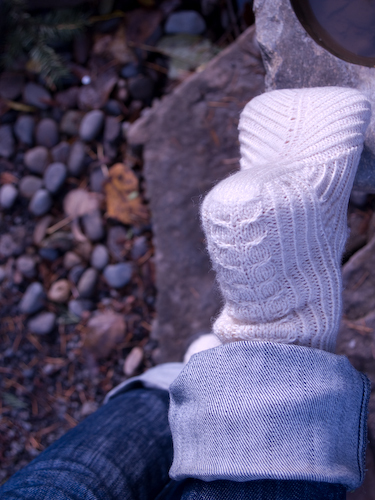 Will I knit two socks together in this manner again? Probably not, as it’s simpler to knit them side by side on two circulars. One has more freedom to work interesting stitch motifs (or ANY stitch motifs) that way, and not having so many stitches crammed onto my favored 5″ dpns is easier on the hands. I found ladders at the needle joins were unavoidable. 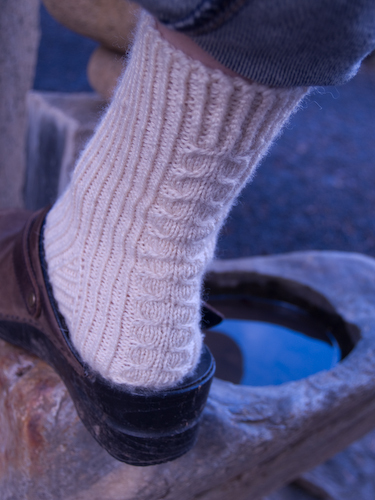 But for a utilitarian pair of vanilla socks, these will serve quite well. The Koigu was happy on the US #1.5 needles, and I’m glad to have finally knit up these two pretty skeins, given to me by Formerly Abundant Lisa in New York many years ago. 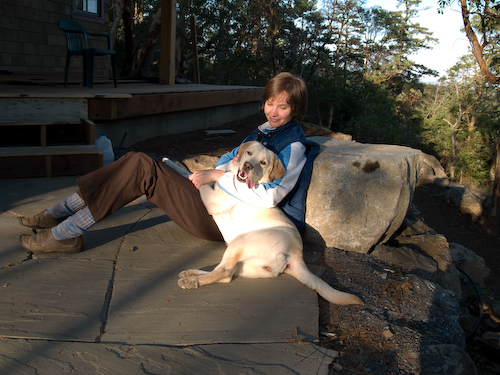 (Lisa still possesses an abundance of many fine qualities… she just doesn’t blog anymore, and I miss her. Also, it is her birthday today. Happy birthday, Lisa!) I’ll wear these often. Hey, anybody out there familiar with the landscape of eastern Oregon or in possession of a fine atlas? These pictures were taken just off I-84 where it follows the Oregon Trail northwest of Ontario in Malheur County. We were about to drive into some beautiful, chalky, rumpled hills. They reminded me of oddly of Yorkshire, were it hot and dessicated and its heather replaced with sagebrush. These pictures don’t show the segment of golden, folded, heat-hazed landscape I liked best, as there weren’t any turnouts and I didn’t fancy the Camry’s modest acceleration abilities against the flotilla of heavily laden trucks that accompanied most of our drive to Idaho. I cannot find out whether these hills have a name. Tub Mountain is marked as their high point, but none of my maps, paper or Google, is specific enough to tell me more. 2 September: I think I’ve set you an impossible task. I’ve looked at a zillion different maps and I just can’t find that those hills have a name. I’m going to declare Molly the winner of the contest since she found Pine Tree Ridge, one of the only two named topographical features in the area. (The other is Moore’s Hollow, which I think is sort of visible as a cleft in the distant background of these photos.) Pine Tree Ridge is just at the edge of the region I’m speaking of. I can’t say I saw a single tree of any kind there, but perhaps there was once a pine tree and that’s why that particular ridge was notable. Anyway, we’ll try to have an easier contest again before year’s end!